In these pants, I attended the Ayala Malls Christmas event held in Fairmont Hotel last week. You know how like when your schedule is so crazy and erratic, the last thing you want to have to worry about as well is your outfit? Yup, that's what it's been like for me lately jetting in and out of Manila, practically living out of a suitcase while at the same time trying to keep up with my deadlines, family and new business ventures. There's never enough time in a day already so I don't really have the extra minutes to sit down and plan my outfits carefully. Dressing up these past few weeks has pretty much been a "throw it together" process. And that's when owning key pieces like this in your wardrobe really matter. I'm talking about slim black pants. The basic of basics. The biggest problem I face when shopping for basics is how difficult they are to come by. How ironic right? But it's true. It's tough finding a good fitting, "basic" black pant cut the right way with the right fabric so it doesn't look too office-y or butch. No pleats in front, those make your tummy bulge. Slit pockets in the back (to flatter your bum) and front (for a nice place to slide your hands in when posing for photos or just standing around). Fabric that doesn't wrinkle too easily so it's great for traveling as well. Fabric that isn't too shiny. Versatile. Easy to dress down for the day or up for semi-formal dinners/meetings/cocktails. That's a long and demanding list of requirements right? But I like to see my money put to good use. Which is also probably why it was so hard for me to find the perfect pair! I did of course, once, but I had to pay quite a premium for it. Well thank god and the heavens, now we don't have to sell our kidneys anymore for a nice pair of pants! MEMO FASHION has decided to fill in that niche! Now both men and women can just pop into any Memo store and pick up a nice fitting pair of trousers or denims in a wide range of colors anytime. And in case you were wondering, a pair of pants only costs about P1,000. Pwede na, right? 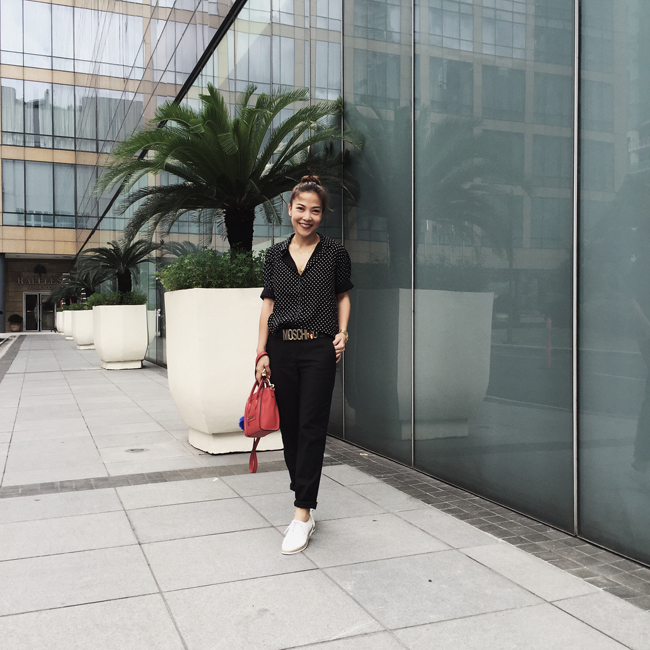 Black pants are a travel staple for me because I wear them with anything and everything: high-heeled sandals, pumps, sneakers, brogues, birkenstocks, tank tops, button downs, blazers, etc. They're great cause you always end up looking put together without trying too hard. Thanks for the tip Ms. Sarah. Will go for slit pockets na next time. Oh, that looks really great on you! Your outfits are always nice. Great tips on finding that perfect trousers. Will remember to take note. I'm more of a demim person but I also love wearing black pants with comfy fabric. Aha! No pleats in front pala ang sikreto. Sige, I shall see if I can keep my tummy hidden aheehee. Thanks for the tips. Very helpful. I agree with the wrinkle-free part, so hard to keep your clothes straight when you're traveling. 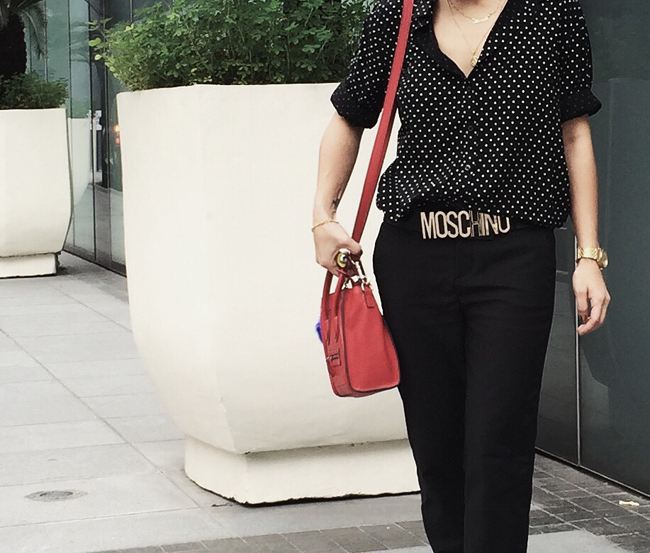 I had lost my interest in black pants since I have difficulty styling them, but this OOTD totally rocks it! Now I realized I have to keep a black pants in my closet. Ang ganda! Thanks for sharing! Everything you throw together always look good! Two weeks ago I was actually looking for basic black pants. Took me ages to find one that fits just right.